Sagittarius's Bow, made of Kaus Borealis (Lambda Sagittarii), Kaus Media (Delta), and Kaus Australis (Epsilon), curve down and to the left in the upper left quadrant of the picture. North is up and to the right. The arrow tip, Alnasl (Gamma Sgr), is down and a bit to the right of Delta. Lambda and Phi (near the top left edge) make the handle of the Little Milk Dipper. Delta and Gamma point downward to the open cluster Messier 6 (in Scorpius) at the bottom left edge. The center of the Galaxy lies a bit up and to the right of it, buried behind the dark dust cloud. All are identified by clicking on the star below. The actual Galactic center, Sagittarius A*, a supermassive black hole of four million solar masses, and its immediate environs (centered on the bright radio source Sagittarius A), are so obscured by interstellar dust (by some 30 magnitudes) that they are quite invisible at optical wavelengths, but show up nicely in the infrared and radio. 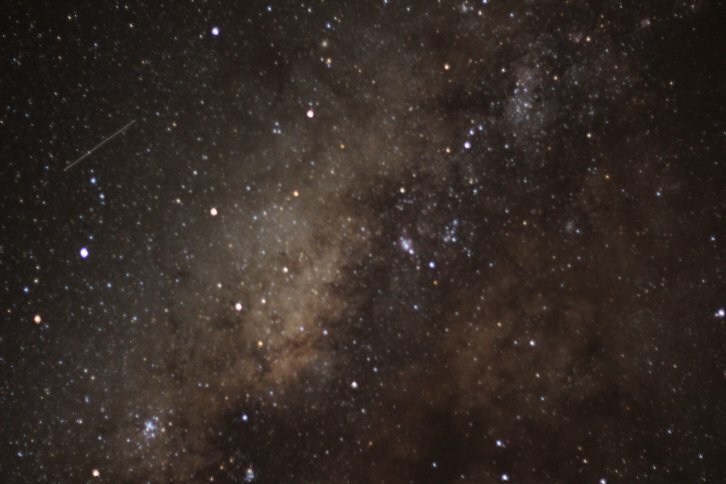 The picture, about 25 degrees wide, is filled with Messier objects, the brightest of which is the large open cluster M7 in Scorpius toward bottom left. The Lagoon Nebula, M8 is just to the right of center. The others can again be found by pushing the star below. The streak at upper left is a satellite trail.